It’s been ten days since Netflix released this streaming TV series to their services and the comic book world is buzzing with how great this series is. Not going to lie, I totally binge watched the whole first season the first weekend it came out. 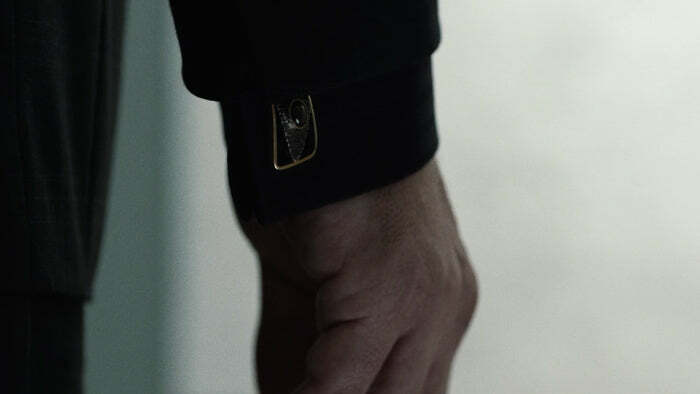 In addition to just being a really well-written show and well acted, there’s really an amazing attention to detail on all kinds of levels from loyalty to the source material, which is of course really important, to language, and for our purposes for this blog entry, the usage of jewelry. 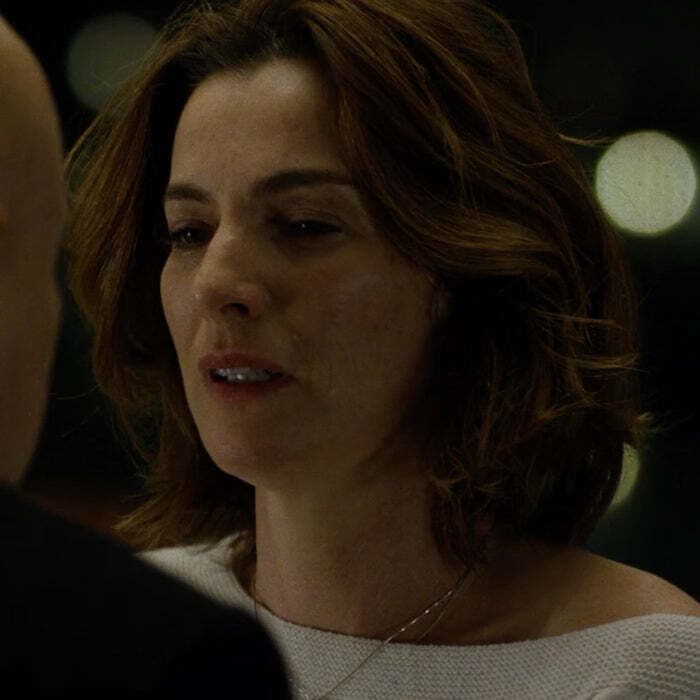 In particular, I want to explore the usage of jewelry and how it shows the development of Wilson Fisk and Vanessa Marianna’s relationship through the course of the show and in a way that only a jewelry company can because we know jewelry. I’ll reference our own catalog here and there, but purely for the sake of real life ballpark numbers and style to illustrate the changes. 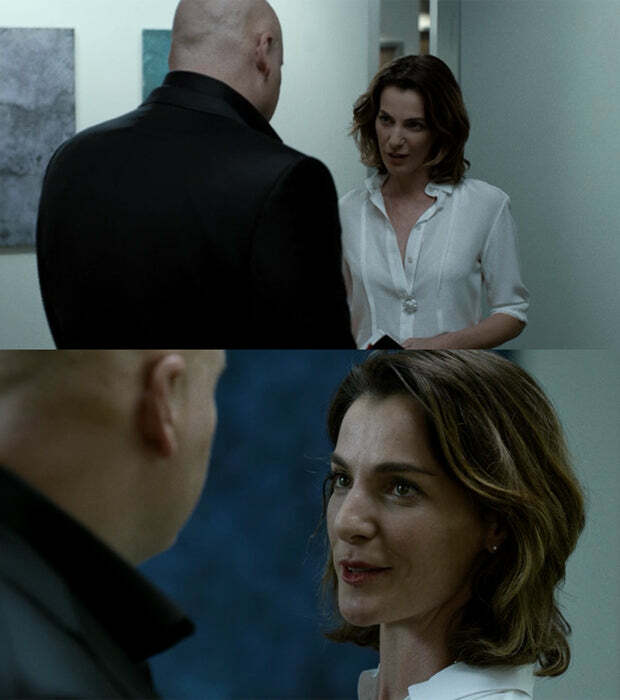 I’ve seen other fans analyze the usage of color in how both characters dress with the focus on how Fisk himself has a wardrobe that changes from black to gray while Vanessa tends to wear more light colored outfits and white. From that you can see how Wilson is affected by Vanessa, but when you look at the jewelry, you can see how Vanessa is affected by Wilson. That said, this entry will be spoiler-ific so if you haven’t already binge watched the entire first season yet yourself and don’t like spoilers, STOP READING NOW. Otherwise, continue. When we first meet Vanessa in episode 3, she wears practically no jewelry. She has earrings on (I know they’re hard to see in this one, that’s the point), but they blend in with her hair. She has a very subtle style herself as the art director to this gallery possibly a choice to let the beauty of the paintings in her gallery stand out more than her. Her dress would even make her seem unassuming if the camera wasn’t actually on her. As for an estimation of worth, you probably could find a nicer high end version of her earrings that uses precious metals at a designer store, but style-wise it also could be something that you buy for $10. Wilson, on the other hand, has fancy cufflinks. These are pretty large and they’re set with what looks like an onyx stone reflecting more of Fisk’s darkness and background, but it’s fairly high end-looking displaying Fisk’s power and how far up he’s brought himself in the world. The next time we see Vanessa in the following episode, she’s wearing slightly more jewelry although still subtle in her style and this is how she’s dressed when Wilson takes her out on their first date. She has a single bauble necklace and on her ears are tiny studs. They don’t even look like they’re diamonds. Just little metal balls and it’s debatable whether or not they’d even be precious metal, but she’s definitely starting to accentuate herself a little more. By episode 8 though, Wilson and Vanessa become closer than ever after having had a tough conversation about honesty and what happened to Wilson as a child. They form a serious bond in Wilson’s fancy apartment with Vanessa staying the night and then dressing him in the morning. This montage of raiding Wilson’s closet is a representation of his transformation for sure, but we get a major look at his high end style and his wide collection of huge cufflinks highlighting Wilson’s love of luxury and the finer things in life as well as the willingness to spend on them. And he said the day before that he wears his cufflinks to show that he’s not a monster. I actually haven’t seen cufflinks this large until this scene. Ever. And I work at a jewelry store. Vanessa also has her own make over with jewelry on her person during the press conference that she didn’t have the previous evening. If I had to place a bet on where they came from, I bet Wilson bought them for her that morning and they look kind of like a pair of diamond earrings and a diamond pendant. The earrings she has are a type of dangling studs, which we don’t carry, but a matching pair of nice diamonds, certified or not can run pretty high. The round diamond stud earrings we carry alone run the gamut from $329 to nearly $15,000 depending on carat weight and if you want certified or non-certified stones. Similar solitaire necklaces like the one Vanessa’s wearing range from about $500 to about $1,200 also depending on carat weight and certification, so Vanessa’s look is also getting an upgrade. Vanessa before and after her night with Wilson. Unlike the previous pieces that Vanessa has worn, these are more than likely things that are not costume jewelry that look real. Wilson doesn’t live like that and he wants Vanessa to have the best. 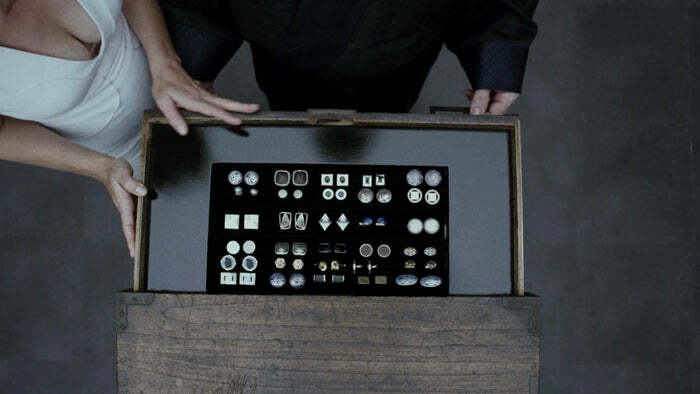 The numbers on those pieces probably do run along the same lines as the items in our catalog. He’s also Kingpin, so of course. 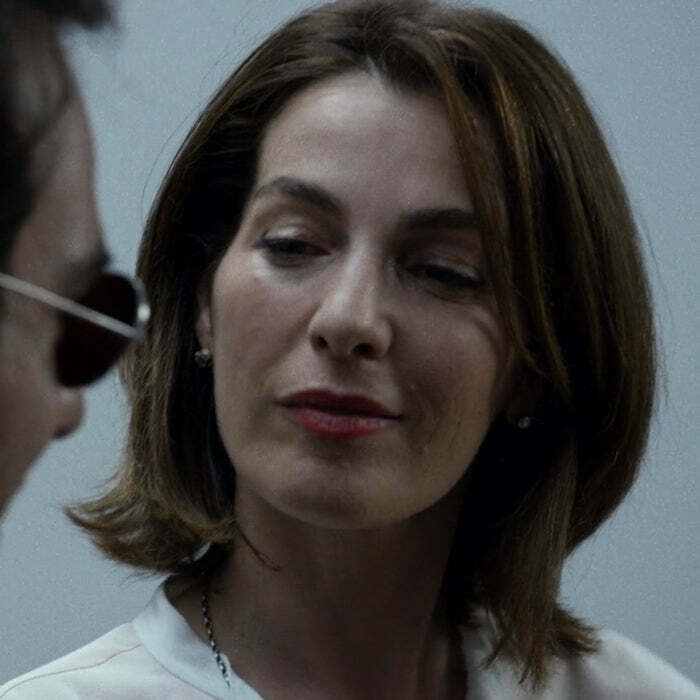 When Matt Murdock/Daredevil meets with her at her gallery in episode 9, she’s rocking legit round diamond studs of a rather impressive size. She also has her standard dangling necklace to suit her more down to earth style as well, but this shot of her with those pricey earrings is very telling. Remember those ballpark numbers from above from our own studs? YEAH. The best quality we carry are H/SI2 for certified and G-H/VS for non-certified too, so the ones she’s actually wearing could very well be even more than that because it’s Wilson we’re talking about. Plus, with the shot the camera has of her ears and the amount of visibility we see, I want to generously guess that the carat weight is even higher than what we have. Let that sink in for a minute. No wonder she seems to be so full of pride in her man in this scene. Then we have episode 10 at the fundraising gala to raise money for improving Hell’s Kitchen. Vanessa is dutifully by Wilson’s side and is wearing what looks like nature inspired gold earrings (possibly a cuff of sorts?) that look like leafy branches and a gold bracelet that appears to also be bezel set with gemstones (my guess is more diamonds). She still picks pieces that match her subtle style as in comparison to some other ladies at the party who are decked out with large necklaces and/or earrings, Vanessa’s jewelry is rather simple looking, but definitely stand out more as she does as Wilson’s prized love. Then after this Vanessa isn’t in most of the rest of the few episodes because of what happens in the gala. 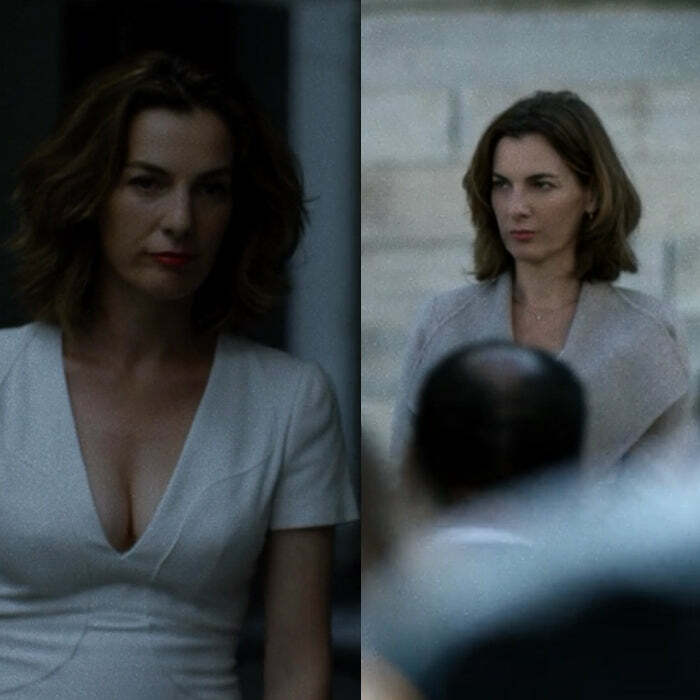 It’s not really relevant to the subject we’re talking about and this blog is long enough as it is, but the next time we see her and jewelry is in the season finale. The police are coming to get Wilson and they’re saying their goodbyes as the TV news outs Wilson and several people connected to his crime network. Vanessa is wearing two necklaces in this scene that we don’t get a really good look at. One looks like it’s probably the solitaire diamond necklace she was wearing in an earlier episode. 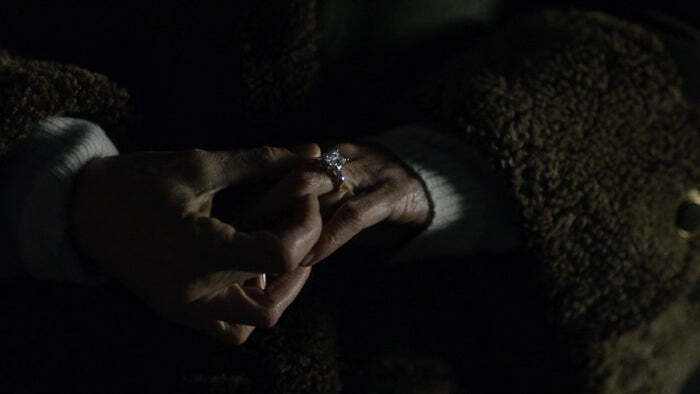 But WAIT, the biggest thing is that Wilson proposes to her! Well, sort of. He hurriedly gives her the engagement ring while the FBI drags him away. He tells her and mouths to her that she’s everything to him. It was really hard to get a shot of the ring in these scene, but we get a good shot of it later when Vanessa’s waiting for him at the docks hoping that he is able to escape. And it’s a three stone engagement ring! Vanessa surely is Wilson’s everything. Engagement ring designs have symbolism to them and a three stone engagement ring represents the past, present, and future of the relationship. The center stone is representative of the here and now and it is impressive. 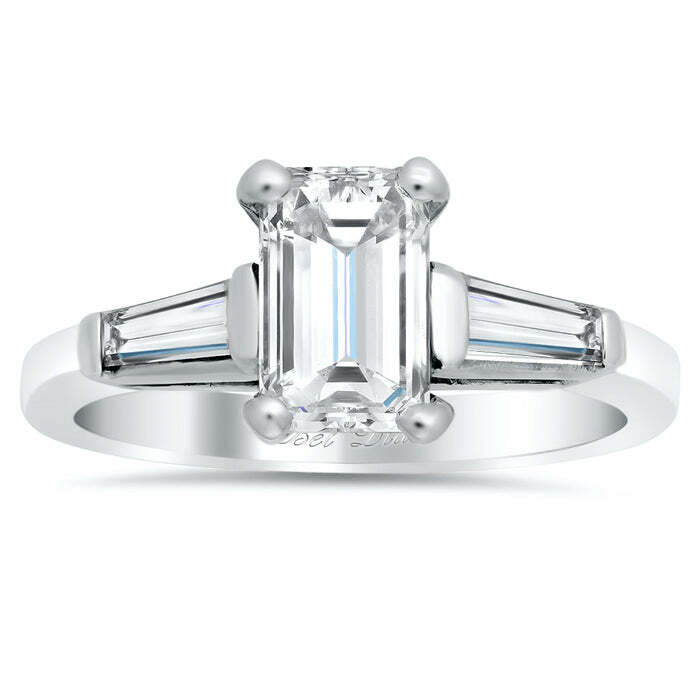 The design is a rendition that features tapered baguette stones which have a taper that allows the eyes to zoom in on the center diamond through the lines the facets form. The one on our site looks like this to give you a better idea of what it looks like. Or at least the props department over at Netflix did a good job at researching to pick the perfect ring and diamond shape to match them and their story. Anyway, we hope you enjoyed this fun look at the jewelry in Daredevil from the perspective of a jeweler. I feel like it adds in another layer of understanding between the two characters that you can only know from knowing the language of jewelry. At deBebians we try to integrate similar themes like this into our pieces because each ring design is unique and will speak to a different couple and the intricacies of their relationship. There’s a whole vast world to explore in jewelry and this is mixed in with all of our designs and the descriptions of our designs on our site. Please feel free to look around and discover the world of jewelry yourself and try to draw your own connections with shows you love. Perhaps a specific piece will even speak to you about your own love story!